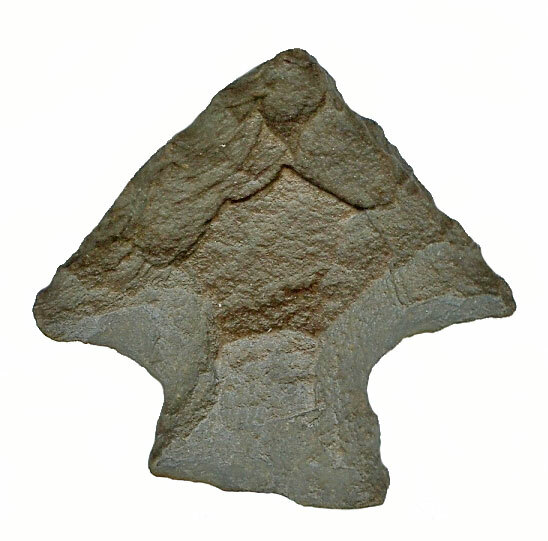 General Description: The Perkiomen point is a broad medium-sized point which has a triangular blade with broadly rounded to angular shoulders and a short expanded stem. Stem edges are ground. The basal edge is straight to slightly convex. The overall shape of the point is very often asymmetrical due to an uneven resharpening process. Exhausted points often acquire the drill form. The flaking is very bold using percussion flaking resulting in semi-lozenge shaped scars. The Perkiomen is found in New Jersey, New York, Pennsylvania and parts of adjacent states. The size range for the Perkiomen point is 50 mm to 228 mm range with typical average length being between 55 mm and 76 mm. Average thickness ranges from 6 mm to 8 mm. Perino states: " The Perkiomen points are of the same age and culture as the Susquehanna Broad points and are found in the same areas, indicating a relationship. Needle tips are more common to new points but may result from the resharpening process. Scrapers are sometimes made from the broken points." Leslie states: " the Perkiomen is very rare in the Susquehanna River Valley and may be related to the Lehigh Broad Spear type." In Pennsylvania, the preferred lithic materials were jasper, dark rhyolite, Onondaga gray and black flints or cherts, Deepkill and Normanskill flints and rarely argillite or quartzite. The Perkiomen point was named by John Witthoft in 1953.